In this game you can connect your Pokemon Ruby, Sapphire, LeafGreen and FireRed to Battle. 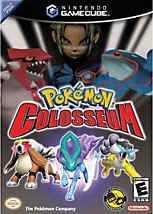 Its sort of like Pokemon Stadium and Pokemon Stadium but with out the Pokemon Lab, Mini Games and the thing where you can play your game on the TV screen. There is also a single player adventure mode where you capture shadow Pokemon and purify them.